Peyton Williams Manning is a former American football quarterback who played 18 seasons in the National Football League, primarily with the Indianapolis Colts. He’s not exactly the worlds most known celeb… but in the football world, he’s a pretty big deal. And do you know what is also a pretty big deal? 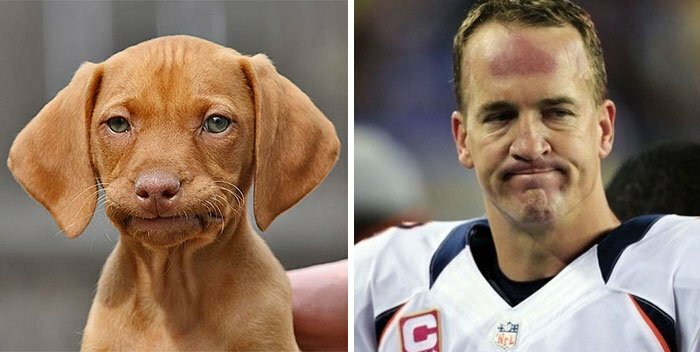 Peyton’s remarkable and uncanny resemblance to this cute little sad puppy. We all know that in sports you win some and you lose some, but for professional athletes losing can be soul-crushing. Therefore, Petyon, whilst losing with colts during a pretty game definitely rembled this big-eyed, sad-faced dog.